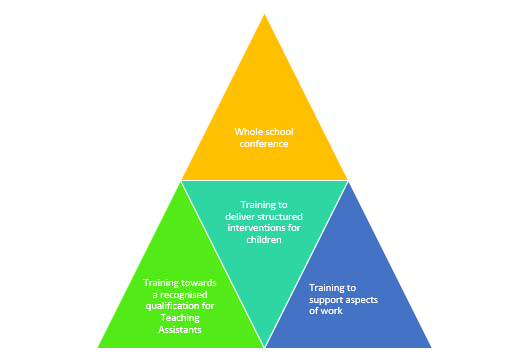 Claycots School Partnership are committed to training and developing our amazing workforce of Teaching Assistants, and are investing time and resources into training programmes for our TAs. Claycots have commissioned CSM training Ltd to deliver the National Vocational Qualification Diploma in Supporting Teaching and Learning in Schools, both Level 2 and Level 3. This involves a mixture of taught content, self-learning and observations and coaching discussions with an assessor in school monthly. Claycots is providing all of those who are working towards their NVQ an hour off timetable per week to support their coursework alongside access to a CPD Zone with new ICT facilities in which to work. 32 Teaching Assistants in the Partnership began their NVQ in November 2016 – we are very excited about this and wish them the best of luck in their studies! Claycots has commissioned Reading Local Education Authority to support us in training 8 of our Teaching Assistants (and Higher Level Teaching Assistants) to deliver 4 linked Maths interventions across school. The TAs who are receiving the training will be qualified to deliver the interventions and make a big difference to children’s learning. If any Teaching Assistant would like training in a specific aspect of their work then in the first instance they can contact the SENCO to discuss this. Every year, Claycots holds a whole-school conference, to which the Teaching Assistants are invited. Venues have included Windsor Racecourse and Legoland. During the conference, Teaching Assistants will join the whole school for keynote speakers and for smaller group activities.